An object so dense that its escape velocity exceeds the speed of light. According to general relativity, such an object must collapse to an infinitely dense point, a singularity. The singularity is surrounded by a surface called the event horizon, within which objects and information can only move inwards, quickly reaching the singularity (and being crushed to a point in the process, of course). Therefore nothing can escape from a black hole. A technical exception is Hawking radiation, a quantum mechanical process first described by Steven Hawking, but this is unimaginably weak for the massive black holes of interest to astronomers. A physical constant that appears in the theory of general relativity. It corresponds to a force between particles which increases with separation, and only has an effect over cosmological distances, hence the name. Although the constant fits well into the equations, they are more elegant when the constant is dropped (set to zero). Einstein originally put the constant in because without it he found that general relativity predicted an expanding or contracting universe, and he assumed that the universe must be static. By doing this he missed the chance to claim the expansion of the universe as a prediction of GR. To rub salt into this wound, it later turned out that Einstein's model of a static universe held balanced by the cosmological constant could never have worked: the balance is precarious and the slightest disturbance would send the universe into accelerating contraction or expansion. Not surprisingly, Einstein called the cosmological constant `my greatest blunder'. A process hypothesised by Enrico Fermi whereby a small fraction of the charged particles in space can be boosted up to the high energies of cosmic rays. The mechanism works on particles which are already distinctly more energetic than average. Fermi imagined the high-energy particles scattered from dense clouds in the interstellar gas, or more correctly from the magnetic field embedded in the clouds. In these collisions the particle gains energy if the cloud is moving towards it, and loses if the cloud is moving away, but Fermi realised that the first case happens slightly more often than the second, so the particles slowly gain energy. In a strange coincidence, in 1977 four independent groups of researchers realised that in shock waves the high-energy particles find that every scattering is nearly head-on, giving much more efficient acceleration (called "first-order Fermi acceleration"). According to simplified calculations, the particles end up with a "power-law" distribution of energies, very like that of the electrons which actually produce cosmic synchrotron radiation. It therefore seems quite likely that the first-order Fermi mechanism is responsible, although things don't agree so nicely when the calculations are done more carefully. Space tells matter how to move; matter tells space how to curve. Because of the curvature of space, the various ways we use to define length end up giving different answers when general relativistic effects are important, for instance in cosmology, or near a black hole. When Einstein proposed the theory in 1916, there was very little evidence in its favour. The situation is very different today: the predictions of General Relativity have been tested with high precision in many ways, in laboratories, in the Solar System, and by observations of distant pulsars. The results agree very well with General Relativity, showing that it must be, at the least, very close to the right answer. For more information, the Relativity and FTL Travel FAQ, has quite a lot about GR. A full appreciation of general relativity involves mastering some difficult mathematics (unlike special relativity). To be honest, even professional astronomers often never get around to learning GR properly! The ratio of the speed of a fluid flow (e.g. a jet) to the speed of sound, so that supersonic flows have Mach numbers greater than one. In jets there are two Mach numbers, depending on whether we use the speed of sound in the outside medium (the external Mach number) or the speed of sound in the jet fluid (the internal Mach number). The systematic study of shape or structure. Often used by astronomers as a pompous synonym for "structure". Sometimes called the fourth state of matter (after solid, liquid and gas), a plasma is a gas in which some of the atoms or molecules are ionised, i.e. their electrons have been stripped off, and are floating around freely. Strictly speaking, almost all gas in space is a plasma, although only a tiny fraction of the atoms are ionised when the temperature is below about 1000 Kelvin. The gas in and around DRAGNs is much hotter than this, and so is a fully ionised plasma. The very low densities in space allow the electrons to travel without much obstruction, so paradoxically space is an almost perfect electrical conductor. Although charges can move around freely, averaged over even small volumes (say a million km across) cosmic plasmas are always neutral (i.e. they contain equal numbers of positive and negative charges), because the electrical forces which arise when charges are noticeably separated are enormously strong. Plasmas in space are permeated by magnetic fields, A good way to think about cosmic magnetic fields is in terms of field lines. These behave like rubber bands embedded in the plasma, so that as the plasma flows the field lines are pulled and stretched along with it. When they are stretched enough they can pull back on the plasma. Individual electrons and ions in the plasma feel a magnetic force which makes them travel in a helical path around the field lines, so that they can only travel long distances in the direction along the field. This binds the plasma together so that it behaves like a continuous medium even when (as in the plasma in DRAGNs) the individual electrons and ions almost never collide. Einstein's theory of motion. The theory is "special" because it describes the special case where gravity can be neglected. For motions much smaller than the speed of light, represented by the symbol c, special relativity gives answers that are almost identical to those provided by "classical mechanics", i.e. the theory of Newton (which is much simpler to use). When objects move at speeds near c, classical mechanics gives the wrong answers and we have to use special relativity. The most important result is that it takes an infinite amount of energy to accelerate anything with finite mass to c, and therefore c acts as a universal speed limit. When the special features of Einstein's theory come into play, we describe motion (and the moving objects) as relativistic. For our purposes, motion faster than about 0.1c counts as mildly relativistic. For more information, see the Relativity and FTL Travel FAQ, practically a complete text on Special Relativity. (Although a real textbook might be easier to use!). Nature's favorite way of making radio waves, named after the machines which produce the same type of radiation in laboratories. Electromagnetic radiation is produced whenever charged particles are accelerated. The particles which do this best, by far, are electrons (and their anti-particles, positrons). Different kinds of radiation are produced by accelerating electrons in different ways; for instance in a commercial radio transmitter the electrons are accelerated back and forth in the antenna by a carefully controlled oscillating voltage, producing radiation at a very precise frequency. Synchrotron radiation is produced by all relativistic electrons in space because they are accelerated by the cosmic magnetic field. Although relativistic electrons are very rare, they produce proportionately much more radiation than normal "slow" electrons, and so tend to dominate the picture. The synchrotron radiation produced by a single electron comes out as a wide range of frequencies peaking at a value set by the electron's energy and the magnetic field strength. The range of frequencies is spread out even more because cosmic radio sources contain electrons with a wide range of energies. The result is a very smooth continuum spectrum (see spectral index for more detail). Another unusual feature of synchrotron radiation is that it is highly polarized. The direction of polarization is perpendicular to the magnetic field in which the electron was moving. When the field in the source is uniform, the degree of polarization is around 70%. More often, we receive radiation from many regions with different magnetic field directions, and when all these arrive together their polarizations cancel to some extent: if the field directions were completely random the net radiation would be unpolarized, but usually there is enough order to give 10 to 30% polarization. At very high surface brightness, the normal synchrotron spectrum is modified by the re-absorption of some of the radiation by the relativistic electrons within the source. This is called synchrotron self-absorption. The effect is to cut off the lower frequency radiation. A unified scheme is a model which "unifies" apparently different types of AGN and/or DRAGN by explaining them as intrinsically similar objects seen at different angles from their central axis (assumed to be the direction along which the jets emerge). Occasionally the term is extended to include models which "unify" different types in more general ways, e.g. by seeing them as different stages in a life-cycle. In this Atlas we always mean the more restrictive sense, sometimes called "orientation-unified schemes". [Plural: Active Galactic Nuclei, (also AGN)]. To try to summarise what we know about AGN is to step into a minefield. There is a "standard model" which everyone agrees is at least partly wrong, but every expert has his or her own proposal for either fixing it up, or replacing it with something completely different. To avoid getting too bogged down in these controversies, the following description is deliberately vague in many places. AGN are exclusively found in the centres of large galaxies; the galaxy containing an AGN is said to be its host. The central light-year or so of an AGN contains an enormous mass, equivalent to at least a million suns, and sometimes ranging up to a few billion suns. This region also contains something that shines brightly in the part of the electromagnetic spectrum from the ultraviolet through to X-rays. There is pretty good (but disputed) evidence that all this is actually concentrated on a much smaller scale, sometimes less than a few light-days across. Certainly the X-rays originate in an astronomically tiny volume, smaller than our own solar system. To put this into perspective, within a light-year of us there is just one sun (ours), and the host galaxies are typically 100 thousand light-years across or more. The thing (if it is one thing) at the heart of an AGN is often called the "monster". If general relativity is correct it seems almost inevitable that nearly all the mass of the monster is contained in a spinning black hole. Black holes don't radiate, by definition, so the radiation from an AGN is believed to come from gas clouds falling into the hole. In a way, the monster works as a sort of engine, fuelled by matter falling in (accreting, in the jargon). To be more precise, the gravitational potential energy of the accreted stuff is ultimately converted to radiation, and to kinetic energy in the form of jets. We don't know just how this happens, although there are dozens of competing theories. At larger distances from the centre swirl clouds of gas and dust which are lit up and heated by the central heart, producing the characteristic emission lines and infra-red radiation. The outermost regions can be imaged from Earth in some of the nearest AGN, but mostly AGN appear just as points of light. Perhaps the weirdest feature of AGN is that they can produce narrow jets of material streaming outwards from the centre. The jets are usually produced in pairs, pointing in opposite directions; occasionally there only seems to be one jet. These jets can sometimes be "seen" directly by radio telescopes, but more often we deduce their existence because far outside the galactic nucleus they produce a DRAGN. In one sense, we should not be too surprised to find jets, since in every other case where accretion is thought to occur in astronomy, jets are also common. These include young stars forming out of gas clouds, and binary stars where matter is falling from one of the pair onto the other. Unfortunately, we don't know how jets are produced in any of these circumstances! Astronomers have defined a dozen or so major types of AGN, each with a different overall pattern of emission. Some of these "types" are only apparently different; for instance, if a thick dust cloud lies between us and the centre, it can block out the radiation at frequencies between visible light and X-rays, so that we only see the radio, infra-red, and high-energy radiation, plus the emission lines from outlying clouds. ---Picture here--- In at least some cases, the dust in the nucleus forms a thick ring around the centre, like an american doughnut (the technical term is torus). Then the appearance of the AGN depends radically on whether we view it side-on, so the centre is hidden, or face-on, so the centre is visible. Based on rather circumstantial evidence, jets are thought to emerge from the AGN at right angles to the dust torus. The various types of AGN can roughly be categorised into two major divisions: radio-loud and radio-quiet. In each division there is a huge range of luminosity, from AGN that are so weak they are barely detectable against the light from central stars of their host galaxy, to quasars which are a hundred or more times brighter than all the stars in their hosts put together. These always produce jets, which are very fast, at least at first. In many, perhaps all, cases, the flow speed is close to the speed of light, and we can see many effects predicted by the theory of special relativity. The power of the jets (i.e. the kinetic energy flowing down them per second) roughly matches the luminosity (i.e. the energy in electromagnetic radiation flowing out from the AGN per second). The best estimate (quite uncertain) is that the jet power is rather larger. Radio-loud AGN are generally are found in elliptical galaxies, almost never in spirals. Many of these also have detectable jets, but they are thousands of times weaker relative to the electromagnetic luminosity. Because the jets are so weak, we know little about them. Radio-quiet AGN are generally found in spiral galaxies, although some of the most luminous ones have elliptical hosts. The obvious differences between spirals and ellipticals occur on scales many times larger than that of the AGN, and we have no real idea how AGN "know" which type of galaxy they are in. Distances to galaxies are found by a long chain of arguments called the cosmological distance ladder. A scale model of the solar system can be constructed from observations of the motions of the planets in the sky. All distances are known in terms of the radius of the Earth's orbit, the Astronomical Unit, (AU). Copernicus made the first roughly accurate solar system model, using data taken in ancient times, in his famous De Revolutionibus (1543). Modern models are exquisitely accurate. The actual distances to most of the planets can be measured by radar, and since we also know the distance to them in AU, the length of the AU can be found (to nine significant figures!). Distances to nearby stars can be found by various geometrical methods. The simples is via their annual parallax, i.e. their apparent change of position in the sky caused by the motion of the observer on Earth around the sun. The best precision is now about three significant figures in a handful of cases. More usefully, the final results of ESA's Hipparcos satellite (released in April 1997) give the parallaxes of around 10,000 stars to within few percent. Before Hipparcos, annual parallaxes were not as important as some more subtle geometric methods, but the new data will change the situation completely. Stars of similar type have similar luminosities. Thus if we know a star's type (from its colour and/or spectrum) we can find its distance by comparing its apparent with its absolute magnitude; the latter derived from geometric parallaxes to nearby stars. Unfortunately nearby stars are not very bright in absolute terms, so we cannot see distant versions very far away (certainly not in other galaxies). Distances to the super-bright stars that can be seen in other galaxies (especially Cepheid variables and RR Lyrae stars) are found by searching for distant star clusters in our Galaxy that contain both a Cepheid (say) and some fainter stars whose absolute magnitudes are known directly. Distances to the nearest galaxies are found using Cepheids, RR Lyraes, etc. The Hubble Space Telescope is now finding Cepheids in galaxies about ten times more distant than was possible from the ground. For more distant galaxies, we need objects even brighter than Cepheids. Examples are supernova explosions, planetary nebulae, and globular star clusters. The absolute magnitudes for such things can't be easily found in our own Galaxy, so they are measured in nearby galaxies (or clusters of galaxies) with Cepheid or similar distances. At the furthest limits, only whole galaxies are detectable. Galaxies come in a very wide range of luminosities, so we need a way to find their luminosity before we can get their distance. Various methods exist. For instance galaxy luminosity is related to the speed of internal motions; most radio galaxies seem to have similar luminosities; the range of brightnesses in clusters of galaxies do not vary much from one cluster to another. At every step of the distance ladder, errors and uncertainties creep in. Each step inherits all the problems of the ones below, and also the errors intrinsic to each step tend to get larger for the more distant objects; thus the spectacular precision at the base of the ladder degenerates into an uncertainty of a factor of several at the very top. To find Hubble's Constant, the ratio of the cosmological recession speed to the distance, we need to go up to Step 7 of the ladder. This is because we can only measure the sum of the recession speed and the random motion of a galaxy, and so we need to go far enough away that the the random motions are small compared to the recession speed. More details of individual methods are given in Ned Wright's The ABC's of Distances. A good book describing the Distance Ladder in detail is Rowan-Robinson (1985) (although a lot has happened since it was written). Far from being distributed at random through space, galaxies and dark matter seem to form in a network of sheets and filaments (the Las Campanas Redshift Survey shows this in spectacular detail). Where sheets intersect, there can be enough galaxies in a small region for gravity to overcome the expansion of the universe, and the galaxies form a cluster, each orbiting in the combined gravitational fields of the others (and the inevitable dark matter). As well as galaxies and dark matter, clusters contain hot diffuse gas, the intra-cluster medium. Because it is so hot, the ICM emits X-rays, and so can be mapped by X-ray telescopes. In large clusters, the ICM contains as much or more mass as the stars in the galaxies (but both are out-weighed 10:1 by the dark matter). Elliptical galaxies are unusually common in clusters, perhaps because ellipticals are produced by galaxy mergers, which are almost inevitable when so many galaxies are so close together. As DRAGNs are usually hosted by ellipticals, they too are often found in clusters. The nearby rich clusters were systematically cataloged by George O. Abell, and are now known by their Abell catalog numbers. Ray White maintains a gallery of Galaxy Cluster Mug Shots featuring optical and X-ray images of some of the most interesting examples. Any type of electromagnetic emission which produces radiation over a relatively wide range of frequencies. c.f. line emission. The central region of the intra-cluster medium in clusters of galaxies can sometimes lose so much energy via X-ray radiation that it cools noticably over the lifetime of the universe. Like any gas that cools, the pressure goes down. Now, the ICM is prevented from collapsing under gravity by its own internal pressure, so the slow loss of pressure from the centre causes the ICM to gradually contract; this phenomenon is called a cooling flow. Actually the "flow" is far too slow to measure; it has to be inferred indirectly from theory. Cosmic rays are really charged particles such as protons, alpha-particles (i.e. helium nuclei) and electrons, travelling at almost the speed of light, c. From the theory of special relativity, cosmic rays carry a very high energy (tending to infinity as the speed tends towards c). This energy is much larger than their rest-mass energy (mc ²), and so they are also known as high-energy or relativistic particles. 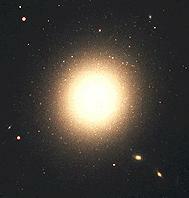 Galaxies are often described as huge collections of stars. This is about as accurate as describing a city as a huge collection of street-lights: stars are certainly the most obvious feature of galaxies when see far away in the dark, but they represent a fairly small fraction of the total mass, 90% or so of which consists of the famous dark matter, whose nature is one of astronomy's biggest mysteries. As well as stars and dark matter, galaxies contain gas and dust in the inter-stellar medium between the stars. The may also contain an active galactic nucleus at their centre. Galaxies come in a wide range of sizes (meaning diameter, brightness, and mass, all of which roughly go together), ranging from tiny dwarfs with only a few million stars, through normal galaxies like our own Milky Way, with a hundred billion stars, to the trillion-star cD galaxies that sit at the centres of the great clusters of galaxies. As is often the case in nature, the smallest are the most common; on the other hand the size of the larger galaxies more than makes up for their rarity, so that a typical star is likely to be in a galaxy with a size approaching that of the Milky Way or larger, and large galaxies are also the easiest to find in the sky, due to Malmquist bias. Normal galaxies come in two basic types: spiral and elliptical. The most common type of normal galaxy. They are distinguished not so much by spiral structure as by a disk of stars and gas all orbiting the galaxy on nearly parallel tracks. Spiral patterns are "ripples" in the disk. Much of the gas in the disk is in the form of cool dense clouds, easily visible in edge-on galaxies because dust in the clouds obscures the starlight behind, causing a dark "dust lane" to cross the galaxy. Where conditions are right, the gas clouds can contract under the force of their own gravity to form clusters of new stars. Therefore the disks of spiral galaxies are home to many newly-formed stars, the most massive of which give the galaxies a characteristically blue tinge. As well as the disk, spirals contain a "bulge" and "halo" of stars moving on more random orbits. Normal ellipticals are quite rare through most of space, but form the majority in big clusters of galaxies, and the most massive galaxies are ellipticals (or the similar cD's) in cluster centres. Elliptical galaxies are rather featureless, and difficult to show in pictures because the brightness falls off so quickly with distance from the centre that you usually end up with the middle over-exposed and the outer parts too faint to see. However you work the exposures, the shape is always elliptical, hence the name. The orbits of stars in ellipticals are in random directions, and often very elongated, taking them close in to the centre and then far into the outskirts. It was once thought that ellipticals were oblate spheroids, i.e. shaped like a hamburger bun, and that they kept this shape because they were slowly rotating. We now know that they are often prolate, like an american football, or even triaxial, meaning they have different "diameters" in all three directions. They hardly rotate at all; instead the shape is maintained because the stars move faster in the direction of the long axis, and so can get further from the centre before gravity turns them back. Another myth about ellipticals is that they contain no gas. In fact they only lack the cold gas found in spirals; their hot inter-stellar medium can contain quite a large mass (though usually rather less than spirals). The lack of cold gas has one crucial effect: stars cannot form any longer in elliptical galaxies; instead all the stars were formed in one go at the same time as the galaxy itself, which probably happened a billion years or so after the big bang. Because bright blue stars have short lives, there are none of these left in ellipticals, which have the reddish colours of long-lived stars. An important exception to these comments is that many ellipticals, especially those containing AGN, have a "mini-disk" embedded in their centres, which can contain cold gas and young stars. These term comes from a classification scheme for galaxies that never really caught on, except for these two (especially cD). They are very similar to ordinary ellipticals, but in the brightness declines rather more slowly with distance from the centre, making it look as if they have a diffuse halo ("D" stands for "diffuse"). For arcane reasons the "c" means the galaxy is extremely luminous. cD's are supergiant galaxies which sit at the centres of rich clusters of galaxies; they are usually several times bigger and brighter than any other galaxy in the cluster. D galaxies are somewhat smaller versions of cDs. In DRAGNs with one-sided jets, or twin jets in which one is distinctly brighter than the other, the lobe containing the (brighter) jet is almost always less depolarized than the lobe on the other ("counter-jet") side. Unified schemes explain the effect neatly, as follows. The asymmetry between the two jets is caused by relativistic beaming, so the brighter jet is coming towards us and hence on the nearer side. The two lobes are embedded in the interstellar medium or halo of the host galaxy, and there is more of this stuff in front of the further lobe than the nearer. As the radio waves from the lobes travel through this material they are affected by Faraday rotation which causes the depolarization. Hence the further lobe, on the counter-jet side, is more depolarized. The effect is named after its discoverers, Robert A. Laing and Simon T. Garrington. An electromagnetic emission process which produces radiation at a number of specific frequencies, c.f. continuum emission. It is so-called because when the light is analysed with a spectrograph, line emission shows up as bright lines crossing the spectrum. --picture?-- Line emission is generally produced by fluorescence, in which atoms or molecules are "excited" to a high energy state by absorbing ultraviolet radiation, and then "decay" to their "rest state" via a series of quantum jumps. In each quantum jump, a photon is emitted with a specific frequency which is determined by the quantum properties of the atom. The frequency of the photon when received on Earth is affected by the Doppler effect because the emitting atom is moving relative to us. Of course we actually receive the accumulated radiation from large numbers of atoms moving with different speeds, so emission lines have a finite width, which are usually specified in terms of the equivalent range of speeds. Generic name for the stuff that fills space, a very dilute gas composed mainly of hydrogen and helium. When the temperature exceeds a few thousand Kelvin, the gas is ionised and is therefore technically a plasma. The medium between the stars within a galaxy. In spirals the ISM is a complex soufflé of hot (million Kelvin) and cool (3 to 100 Kelvin), gas, where the cooler regions have higher density so that the pressure is roughly constant. In ellipticals the ISM consists almost entirely of "hot" gas (roughly ten million Kelvin) which extends seamlessly into a gaseous halo surrounding the galaxy. The hot gas (several tens of millions of Kelvin) filling groups and clusters of galaxies. In big clusters, the ICM can contain more material than all the galaxies put together. The gas filling the regions between clusters of galaxies. We don't know whether there really is a proper IGM, or whether the gas just gets thinner and thinner as you go away from one cluster, until you reach the far outskirts of the next. The common name for our own Galaxy (which is just greek for Milky Way!). Astronomers usually just call it the Galaxy, with a capital G to distinguish it from other galaxies in the universe. The Milky Way is a large galaxy of spiral type, and our sun is in the disk, roughly 25,000 light-years (8 kpc) from the centre. The disk is visible as the faint band of milky light that circles the night sky, which is made up of myriads of distant stars. A starburst galaxy is a galaxy that is undergoing a sudden burst of star formation. This has a big effect on its luminosity because the most massive and luminous stars are very short-lived and so the number of them in a galaxy depends on the rate at which stars are being formed, rather than the total mass of the galaxy. The luminosities at radio and far infra-red wavelengths are particularly boosted in starbursts, and as a result starburst galaxies are the second-brightest type of extragalactic radio source, after DRAGNs. Technically, a starburst galaxy is defined as one which is making stars so fast that it would convert all its gas into stars in a much shorter time than the age of the universe; so that we really are looking at a "burst" which must have started in the recent past. On the other hand, the lower rates of star formation which go on continuously in spiral galaxies produce radio emission in exactly the same way as in starburst galaxies. For this reason Starburst emission has come to mean all radio emission produced as a by-product of star formation, whether in genuine starbursts or not. More details about starburst galaxies are provided by the Jodrell Starburst research group. The technique of combining the signals from a collection of individual antennas or telescopes to provide an image with a resolution equivalent to a single telescope with a size roughly equal to the maximum distance between the individual antennas. This may be quite large, e.g. 217 km for MERLIN, and up to the size of the Earth for VLBI. The technique is briefly explained in the MERLIN User's Guide. The business of observational astronomy boils down to measuring the brightness of celestial objects. Unfortunately, the English word "brightness" covers three quite different concepts, each of which covers several subtle variations. When we describe Eta Carina as the brightest star in the Galaxy, we are talking about luminosity. This is a measure of how bright things are intrinsically. It can be measured in Watts, or Watts per Hertz to describe the luminosity at a specific frequency. For historical reasons in optical astronomy absolute magnitude is used, and radio astronomers quote the power, which is the luminosity per steradian (multiply by 4 pi to get back to luminosity). When we describe Sirius as the brightest star in the sky, we are talking about flux density. This is a measure of how bright things seem to us from our platform on Earth. It depends both on the luminosity and the distance, since distant objects appear fainter. Radio astronomers measure this in units of Jansky, optical astronomers use apparent magnitude. This is what we mean when we say that the centre of a galaxy is brighter than the outer regions; an image is essentially a map of intensity. It measures the flux density we receive, not from the object as a whole, but from each unit area of the sky (technically, solid angle). The flux density of an object is thus the product of its intensity times its solid angle. As radio waves travel through the inter-stellar medium, their plane of polarization slowly rotates, with the amount of rotation increasing with the square of the wavelength. This phenomenon is known as Faraday rotation, since Michael Faraday discovered the analogous effect in light passing through certain materials. The rate of rotation depends on the density of electrons and the strength and direction of the magnetic field through which the radio waves travel, and so Faraday rotation can be used to investigate these quantities. The total amount of Faraday rotation affecting the radio waves from a source is called the Rotation Measure (RM). Unit of flux density, named after Karl Jansky, who first discovered extra-terrestrial radio waves (from the Milky Way) at Bell Telephone Laboratories in Holmdel, New Jersey, in 1932. 1 Jy = 10-26 Watt Hertz-1metre-2. In the second century B.C., the greek astronomer Hipparchus made a catalogue of stars, and divided them into five "magnitudes", with stars of the first magnitude the brightest, and the fifth magnitude the weakest. In the 19th century it became possible to measure accurately the relative brightness of stars. Tragically, rather than starting anew with a sensible system, astronomers followed a proposal by Pogson which re-defined magnitudes in such a way that most of the traditional magnitudes of stars stayed roughly the same. The awful formula that resulted has become one of the initiation rituals of modern astronomy, and is therefore not described here. Suffice it to say that we are stuck with a logarithmic scale on which the numbers get smaller as stars get brighter, so that the brightest stars even have negative magnitudes. These are actually measures of flux density, known as apparent magnitude in this context. The equivalent measure of luminosity, absolute magnitude, is the apparent magnitude an object would have if seen from a distance of 10 parsecs. where is the observed intensity and was the intensity at the emitting region. This definition also makes optical depth proportional to the amount of obscuring stuff along the line of sight. The optical depth actually depends on the frequency of radiation, with different parts of the electromagnetic spectrum being affected by different kinds of "stuff". For instance, blue light is strongly affected by interstellar dust, so dust clouds have high blue-light optical depth; on the other hand radio waves are unaffected by dust so the radio optical depth of dust clouds is zero. Electromagnetic waves consist of vibrating electric and magnetic fields, with the direction of vibration perpendicular to the direction of motion of the wave. If the direction of vibration remains steady with time, the wave is said to be 100% linearly polarized in that direction. If the direction of vibration rotates at the same frequency as the wave, the wave is said to be 100% circularly polarized. Most naturally occurring electromagnetic waves have a direction of vibration that jiggles around at random: these are said to be unpolarized. Intermediate states, where there is some jiggling around an average direction, are said to be partially polarized; the amount of order is specified by the degree of polarization which ranges from 0 to 100%. Synchrotron radiation is unusual as a natural source of highly-polarized radiation. Polarization is affected by Faraday rotation. In an extended source such as a DRAGN, the polarization from different regions may be rotated by different amounts, which can depolarize the source. The rotation, and hence depolarization, is negligible at short wavelengths, and becomes progressively more important at longer wavelengths. The direction of an "arrow" on the sky, for instance the long axis of a DRAGN, is given by its Position Angle (PA), which is zero if the direction is due north and increases as the arrow rotates to the east, i.e. to the left, if north is at the top of the image, since you are looking up. All images are blurred to some extent; otherwise they would contain infinitely fine detail and hence an infinite amount of information. The amount of blurring is technically called the resolution of the image, with high resolution meaning little blurring. This can be quantified by defining the Point spread function, which is the pattern produced by the spread-out light from a single point. For historical reasons, radio astronomers call the point spread function the beam. The beam on the images in this atlas is a simple pattern technically called a "Gaussian"; its "size" is characterised by the full-width at half maximum (FWHM). The maximum resolution available from a telescope is set by the phenomenon of diffraction, and gives a FWHM approximately equal to the ratio of wavelength to the diameter of the telescope. Since radio waves have very long wavelengths (e.g. 21 cm for most of the images in the Atlas), they have to be very large to achieve high resolution. This is usually achieved by using the technique of Aperture Synthesis. Linear LUT Logarithmic LUT. Intensity profile. where is the flux density at frequency , and α is the spectral index. When the spectral index is zero, the flux density is independent of frequency, and the spectrum is said to be flat. The spectrum of an object is a graph of its brightness at each wavelength of light, versus wavelength. Sometimes, instead of wavelength, frequency or photon energy is used; all three graphs are equivalent. Here 'light' is used as a shorthand for electromagnetic radiation of all kinds, from radio through to gamma rays. You can think of an astronomical image as a map of the radiation received from some small region of the sky. The coordinates of the map therefore correspond to angles on the celestial sphere. This means that the directly-measurable "sizes" and "areas" of astronomical objects are actually angles and solid angles; to convert to real lengths we have to find the distance, which is usually not known very accurately. Astronomers still use the units of angles invented by the ancient Babylonians, in which the 360 degrees of the circle are each divided into 60 minutes of arc, or arcmin, and each minute of arc is divided into 60 seconds of arc, or arcsec. Since the Babylonians stopped here, fractions of an arcsec are quoted using decimal notation, and even S.I. prefixes, hence milliarcsec, microarcsec. Radians rarely makes an appearance in astronomy. However, solid angles are often quoted in steradians; square arcsec is a popular alternative. If this seems needlessly complicated, check out the way coordinates on the sky are specified. The distance light travels in a year. The preferred unit of astronomers, apparently adopted in the late 19th century because light-years were becoming too widely used by the general public! Roughly the distance to the nearest star. 1 pc = 3.26 light years = 3.086×1016 metres. A thousand parsecs. A useful unit when describing galaxies, which can be anything from a few kpc to 100 kpc in size. A million parsecs. Typically used to give distances to galaxies. A visibility is the technical term for the datum produced by a radio interferometer or aperture synthesis array. It is a measure of one Fourier component of the region of sky being observed. Very Long Baseline Interferometry: a form of Aperture Synthesis in which the individual telescopes are not directly connected together, but instead record their data on magnetic tape. At a later date, the tapes are shipped to a central "correlator" where they can be played back together and the signals combined. The advantage of this system is that the telescopes in the array can be arbitrarily far apart, (often on different continents) and so the technique provides the highest resolution images in astronomy, with beamwidths in the range 0.1 to 10 milliarcsec (depending on the radio frequency).